The electronic smoking industry is a relatively new phenomenon with a rapidly changing regulatory landscape. Some states are only beginning to consider how to regulate this industry, while others have taken an aggressive approach. An e-cigarette retailer must investigate state and local requirements before operating. To remain in compliance they must also stay abreast of regulatory changes that may affect their industry and their good standing in the jurisdiction. Several states have expanded the scope of cigarette retail licenses to apply to sellers of electronic cigarettes. They have required e-cigarette retailers to obtain the state wide cigarette retailer license, formerly only applicable to traditional tobacco cigarettes. In Kansas, the Department of Revenue requires a distributor/retailer of e-cigarettes to acquire a cigarette license prior to selling e-cigarettes. The license has a fee of $25 per location. Retailers must purchase their cigarettes and e-cigarettes from a wholesaler that is licensed to business in Kansas. Maine and New York both have legislation pending that would require e-cigarette retailers to obtain a tobacco retail license. The sale of e-cigarettes is generally subject to sales tax. E-cigarette retailers will need to register for sales tax in each state that they sell their product. Electronic cigarettes have avoided high excise taxes thus far because they are not considered “tobacco” products under state tax law. Retailers of electronic cigarettes are subject to state and local basic business licenses, like any other merchant. If they plan to temporarily sell their goods in a town or city, they may need a vendor license or a transient merchant license. Retailers may also be subject to local sales tax. Other issues that electronic cigarette retailers must be aware of are laws regarding the sale of e-cigarettes to minors and the use of e-cigarettes in public spaces. Almost half of the states have banned the sale of e-cigarettes to minors under the age of 18. Several states and some cities have restrictions on the use of e-cigarettes in public spaces. 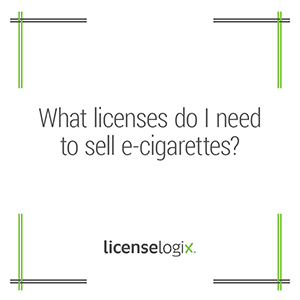 LicenseLogix will help guide e-cigarette retailers through the changing landscape of licensing requirements and regulations. We can help you obtain all of the licenses and registrations you need, minimizing time-consuming and costly delays. For additional help you can fill in the form on the bottom or give us a call at (800) 292-0909.